June 9th, 2010 11:12 AM | by William Bell | Preterism. future Tribulation Period teaching books by Tim LaHaye and Jerry Jenkins have steered so many in the wrong direction regarding the end times. The idea that God will one day en mass remove all Christians from the earth is totally unfounded in Scripture. In fact, it is diametrically opposite to what the Biblical text says. The principle which must be kept in mind is that we’re discussing judgment passages. Christ did not leave us in the dark about what happened during judgment. He gave two very well-known examples to his hearers that have a direct bearing on this subject. Those two examples are those of Noah and Lot. So, any doctrine of the end time must align closely with those events. Why, because the Lord said, “as it was in the days of Noah, so shall it be in the days of the coming of the Son of Man.” Likewise, he said the same of the days of Lot. If no one asks the question of what actually happened in the days of the judgment upon the world in the days of Noah which Christ likened to the endtime judgment, the premillennial Dispensationalists are not going to tell you. So, let’s ask the question. Did God rapture saints from the earth in the days of Noah? Is there anyone who would not readily answer no to that question? 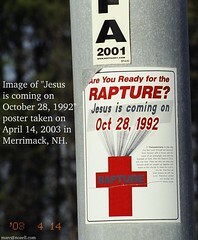 Let’s face it, there is absolutely no record of a Rapture in the days of the flood. Next question. Who were the leftbehind? Was it the wicked who remained on earth while the righteous were transported to heaven? Again the answer is no. If anything, the wicked were taken and the righteous were left. (See this principle in the parable of the tares, (Matt. 13:28-30). Why did God leave the righteous on earth? So they could repopulate the world with righteous people. One of the first things God told Noah after the flood was to replenish the earth. “So God blessed Noah and his sons, and said to them: ‘Be fruitful and multiply, and fill the earth. '” (Gen. 9:1). Now he certainly did not mean with wicked people. Wasn’t that the reason the flood came in the first place? Who was leftbehind in the days of Lot? Well, it certainly was not the wicked. The Bible says God knew how to deliver the godly out of temptations to reserve the unjust under punishment for the day of judgment. Lot and his family remained on earth. Jesus took these two examples and said his Parousia (coming) would be just as those were. In both cases, God took the wicked from the earth through a judgment upon the land, and left the righteous. Therefore the righteous are the leftbehind! The series by Tim LaHaye and Jerry Jenkins is pure myth. It is contrary to scripture. They teach a coming unlike the days of Noah and Lot. After the flood, God promised to never again destroy the world as he had done in the days of Noah. First things first. God never destroyed the earth in the first place. He destroy the “world of the ungodly”, i.e. the wicked people from the earth, (1 Pet. 2:5). Secondly, after destroying the wicked because of the continual evil in their hearts, he vowed to never destroy the world meaning the “world of the ungodly” as he had done even though man’s heart was evil from his youth. See Gen. 8:21-22). The earth was never the object of destruction, but the ungodly people. Further, God compares the throne of Christ and its duration with that of the heavenly bodies. In other words, Christ and his throne continue as long as the earth, sun, moon and stars continue. “My covenant I will not break, Nor alter the word that has gone out of my lips. Once I have sworn by My holiness; I will not lie to David; His seed shall endure forever, and his throne as the sun before Me; It shall be established forever like the moon, even the faithful witness in the sky.” (Psa. 89:34-37). In addition, God said David’s seed (Christ) would endure forever and his throne as the days of heaven. (Psa. 89:29). So let’s put this in the form of an argument. The throne of Christ endures forever as the days of heaven. The throne of Christ endures forever as the sun and shall be established forever as the moon. Therefore, enduring forever as the days of heaven equals enduring forever as the sun and moon. Here is the point. When the days of heaven cease, the sun and moon will cease. When the sun and moon cease, the throne of Christ will cease. But the throne of Christ endures forever and has no end, (Isa. 9:7, Luke 1:32-33). Therefore, the days of heaven and the sun and moon have no end. There is no earth ending judgment depicted by the fairy tales in the Leftbehind books. He said the people ate, drank, married and were given in marriage, planted, bought and sold in the days before the flood, until the day that the flood came. In other words, the last day was not the last day of time per leftbehind advocates. Rather, it was the last day of the people who were experiencing that judgment. The world and time continued and does so to this day. The same was true of the days of Lot. They ate, they drank, they planted, bought and sold, until the days beforehand until the day God rained fire and brimstone from heaven. It was the last day of the wicked in Sodom and Gomorrah, but not the last day of time. Likewise, the coming of Christ was not a time-ending event. It was a judgment upon Jerusalem and the world in A.D. 70, but time continues on as no one can deny. The great tribulation preceded that event and occurred in connection with it. Yet, all happened in that first century generation, (Matthew. 24:, 29-34). The leftbehind Rapture teaching gets lost in the simplicity and clarity of this language. « The Antichrist Revealed – Who Is It?